Not only was it outrageously expensive, not only is it delayed yet again. 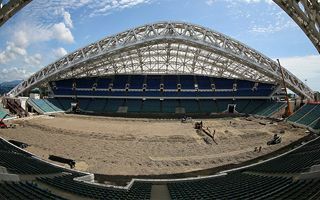 Now we also know that the new Sochi stadium will not have a tenant at least until 2018/19 Premier League season. 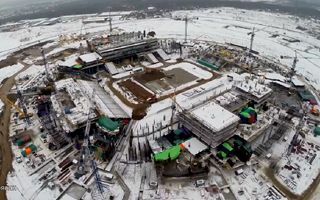 From today onwards we’ll be showing you all of the 2018 World Cup construction sites. 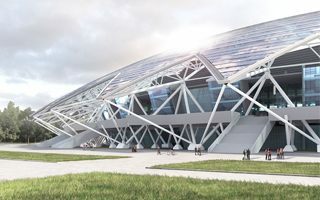 Volgograd’s steel-bound arena comes last, courtesy of the general contractor. Despite earlier announcements of first game in 2016, now official sources suggest the opening match won’t be held until early 2017. Meanwhile we get a grasp of the future leisure hub around Russia’s national stadium. 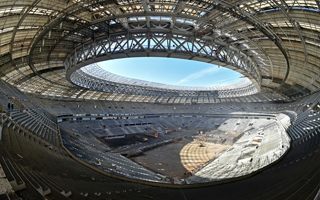 11.05.2016 Russia 2018: Samara stadium twice as expensive?! It’s been clear that contractor change is caused by insufficient funding, but the scale remained unclear until now. 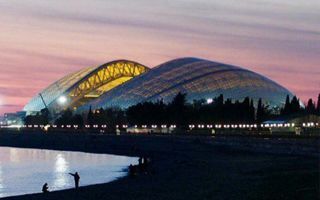 Samara Arena may be over two times more expensive than planned. 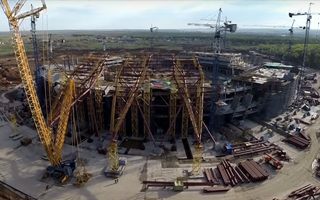 PSO Kazan is no longer in charge of the construction in Samara. The company would not complete the project within promised budget and had to step down. 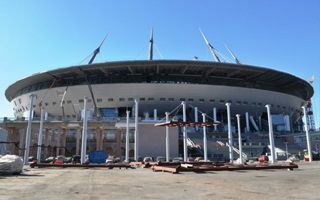 General director of Moscow’s most modern stadium leaves no doubt: there is no chance that the arena will generate enough revenue to recoup construction cost. 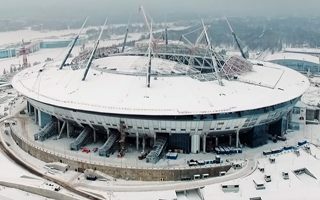 It’s a minor relief compared to the stadium’s budget, but one of subcontractors is now forced to return 570 million rubles for artificially inflating prices. Although construction has been ongoing for just over a year, masonry works are now 90% done, while the overall structure is taking shape very fast. 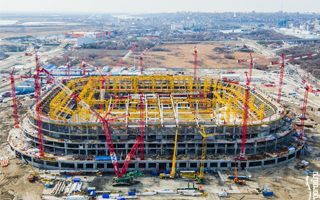 With only minor works ongoing regarding construction, Russia’s largest stadium is shifting focus to systems and furnishings as the project continues to be ahead of schedule. 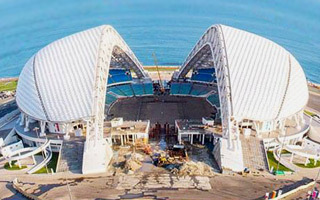 We won’t see reopening of the Sochi Olympic Stadium earlier than in March of 2017. Meanwhile, the stadium was due for delivery in three months from now. 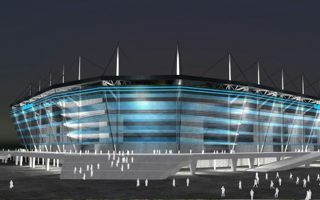 This will be one of the most futuristic stadiums in Russia, rightly nicknamed Cosmos Arena. Yesterday the mounting of first 134-ton roof segment ended. 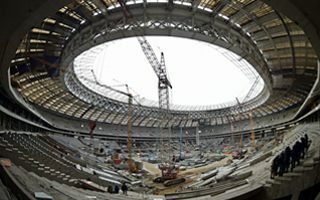 Landscaping and roads around Russia’s most impressive stadium will cost almost 2 billion rubles. But before these works begin, the retractable roof will get done. On Friday at the latest! 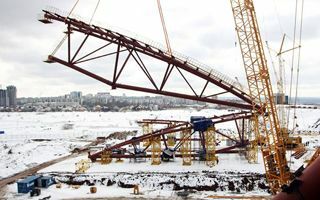 Piling works are ending in Kaliningrad, but the city remains the single most delayed in stadium preparations for the 2018 World Cup. Still, it’s the post-tournament use that causes more concern. If you needed proof of just how wet the ground is at Kaliningrad’s future stadium, there you have it. 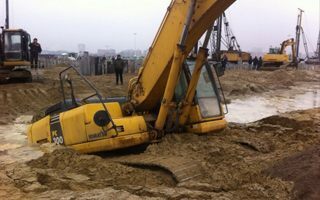 A large excavator sunk into mire as its operator most likely acted carelessly. Renovation of the historic façade is well underway and installation of the field will begin this summer. 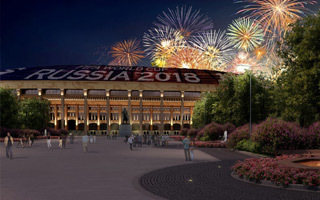 By year end we’ll see the legendary Russian stadium in full glory again. 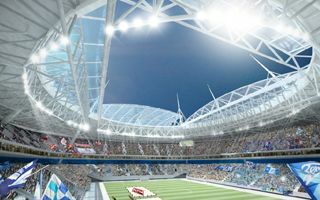 Ridiculed numerous times, and rightly so, the delivery of stunning Zenit Arena is finally only months away. Still, there’s 18% of works yet to be delivered. 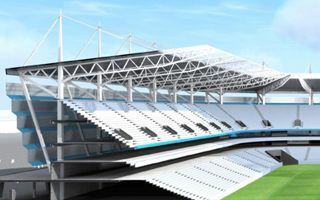 To build a stadium within the ever tighter budget contractors had to adjust its design and remove further elements. 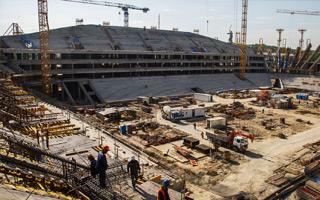 But in return the new Kaliningrad stadium should be ready extremely fast. Nearly all of the main structure is ready and you can clearly see the changed seating bowl. Now with two tiers and no room for a running track, the stands will soon hold 81,000 seats. 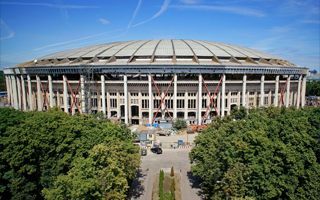 Stadion Fisht will be among the venues of 2017 Confederations Cup. To meet deadlines, employment on site will grow by 25% in 2016. They’re well advanced and ahead of schedule. 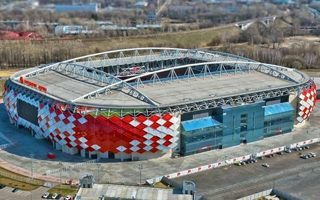 From now on the builders in Samara are also possible to admire via StadiumDB!